Join us in Alaska Sept. 10 – 12 for the 2015 NFPW National Conference, New Frontiers in the Last Frontier. Register for the conference. 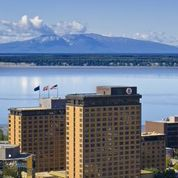 You’ll be staying in downtown Anchorage at the Hotel Captain Cook, the premier hotel in Anchorage. It’s easy distance to shops, jogging trails, and our beautiful museum. Check out the Captain Cook Neighborhood. We have a very special rate of $175, including free wi-fi and use of the athletic club. Deadline to guarantee this rate was Aug. 6. Book online with the Captain Cook (This link will automatically input the conference code of NFPW2015. When you select the September calendar for your arrival date, the $175 rate is available for all dates from Sept. 3 – 16.) Or call 907-276-6000 or 800-843-1950 to make your reservation. Airport/Hotel Transportation Options: There has been some confusion about airport/hotel transportation, so hopefully this will help clear it up. The hotel does not have a shuttle. However, taxis are readily available, so there is generally no wait for them at the hotel or airport. The cost is approximately $20 total each way for any number of people you can fit. There is a 24-hour airport shuttle called BAC Transportation. You can schedule it when you arrive by calling 907-570-TOUR (8767), or go to the kiosk near baggage claim at the airport, or have the hotel call when you are checking out. There is generally a 15 – 30-minute wait. Cost is $10 per person each way. If several of you are traveling together, you can book the shuttle: http://www.bactrans.com/shuttle/. Shuttle Services of Alaska is available 24 hours and can be arranged ahead of time at http://www.shuttleservicesak.com/. They charge a base rate of $35 and then $5/person, plus 18% grtuity. They will meet your flight outside baggage claim, so there is no wait. You can also order them by phone at 907-947-8985 with approximately a 15-minute wait. The opening keynote will feature Anchorage’s 2015 centenary celebration with a multimedia program, detailing Alaska and Anchorage’s history through video collected by the Alaska Moving Images Preservation Association. Dr. Rosita Worl, who will offer both a keynote speech and a workshop on Alaska’s Native peoples, their history and culture and how they are taking their place in a modern world, while retaining those attributes that are the hallmarks of their culture. Dr. Worl is Tlingit from Southeast Alaska and a world-renowned expert in her field. Aliza Sherman, who helped pave the way for women online and in the Internet industry. She is a web and social mobile pioneer whose work helped shape the early new media industry. She is an international keynote speaker, author of 10 books, and a digital strategist since 1992.In addition to starting the first woman-owned Internet company in the early 90s, Cybergrrl, Inc., she has been writing, speaking and consulting about social media since 2006 and social mobile marketing since 2010. She is also well known for her expertise on women’s technology and business issues. APC has gathered a rich variety of speakers from all walks of media life, from writers and photographers to news anchors and PR specialists, so we’re confident that if you attend, you will find subjects that interest you. Anchorage was recently named one of the Best Towns in America by Outside Magazine. More than 1.5 million votes were cast in the competition, so we’re looking forward to sharing our award-winning city and state with you. Interested in books about Alaska? Find out more from Alaska Sampler, a free e-book anthology, to connect readers with Alaska-inspired books. Want to tour Alaska on your own? The Alaska Dispatch News just released the 2015 Visitors’ Guide to Alaska. Have just one day to tour on your own? Use the Visitor’s Guide: Animals and Adventure in the Mat-Su for a day trip just an hour’s drive north of Anchorage.